When it comes to IT security and especially network security, we recommend using the distribution Kali Linux, which comes with everything you need to test the security of networks or to save data. Kali Linux is a toolbox for hackers, pentesters and IT security specialists who want to pinch networks. Kali Linux on Raspberry Pi For a security expert or Pentester, Kali Linux on a Raspberry Pi is gross nonsense. Because Raspberry Pi is unsuitable for serious pentesting and hacking. it just has too little computing power. But the often-recommended use of Kali Linux in a virtual machine is also unsuitable for serious pentesting and hacking. Many applications require direct access to the hardware, which is difficult in a virtual machine. Here, the hardware is only passed through virtually by a host system. And that's where a Raspberry Pi can be an alternative. With around 35$, it is cheaper than if you acquire a separate notebook on which you want to work exclusively with Kali Linux. Although that would be the only right way. Typically, for the first steps with Raspberry Pi, the Linux distribution Raspbian based on Debian is used. This is not always the preferred distribution. Special tasks always have certain requirements that a standard distribution cannot fulfill. In addition to the usual live CD and USB versions, there are also images for mini-computers, such as Raspberry Pi. Restrictive, it must be said that the image for Raspberry Pi is a slimmed-down version, which brings fewer tools. However, that is enough for a start. What is missing can usually be easily installed by "apt-get". The spying and interception of data that is not intended for one's own is prohibited by articles 202a and 202b of the Penal Code. The offer would include a fine or imprisonment of up to three or two years. (1) Anyone who makes unauthorized access or other access to data that is not intended for him and who is particularly secure against unauthorized access by overcoming the access security shall be punished with imprisonment of up to three years or a fine. (2) Data within the meaning of paragraph 1 are only those which are stored or transmitted electronically, magnetically or otherwise not immediately perceptible. Anyone who, without authorization, or another person using technical means (§ 202a (2)) from non-public data transmission or from the electromagnetic radiation of a data processing system, shall be punished with imprisonment of up to two years or a fine if the Act not in other regulations is threatened with more severe punishment. Unlike other computers, Raspberry Pi does not have a fixed data store from which to boot. The boot process is done from an SD memory card, which must be described with an image before. The image is usually a pre-installed operating system. That is, the image is written on the SD card inserted in Raspberry Pi and connected to the power via AC adapter. After a few seconds, a fully functional operating system will be available. Such a finished image is also available from Kali Linux for Raspberry Pi. The developer of Kali Linux offers different images for different systems. Select a suitable image for Raspberry Pi (2). Download, unpack and write the image onto an SD card. Put Kali Linux into operation on Raspberry Pi. Go to the website of Kali Linux. Download the current image for Raspberry Pi . Extract the compressed archive file (eg with 7-Zip in Windows). Write the image on an SD card (4 GB are enough). Take a Raspberry Pi into operation (takes longer than Raspbian). The password of the user "root" is "toor". The ISO image for a live CD or a live USB stick is located here. The password of the user "root" is "toor". After the first login you should change the password. Note: The question is whether you should ever make one again after the first software update. The problem is that you want to work with a software stable as stable as possible. After an upgrade, the software version does not necessarily have to be stable. It may be that you get better software, but it can also be flawed or fundamentally changed in functionality. You have to be clear about what you want. Do you always want the latest software with new features and bug fixes? Then you have to expect that one or the other tool may work differently after a long time. Or you leave everything, even over years, unchanged and work with a system that always works. The stupidest thing that can happen is that you get a Pentesting job after an upgrade and can not do it because the system does not work as usual. And only because you absolutely had to upgrade. Restrictive, it must be said that the image for Raspberry Pi is a slimmed-down version, which brings fewer tools. However, that is enough for a start. What is missing can usually be easily installed by "apt-get". If you later work with the graphical user interface it is recommended to install LXTerminal. This terminal allows to open several terminal tabs. This can be beneficial for one or the other hacking or pentesting. 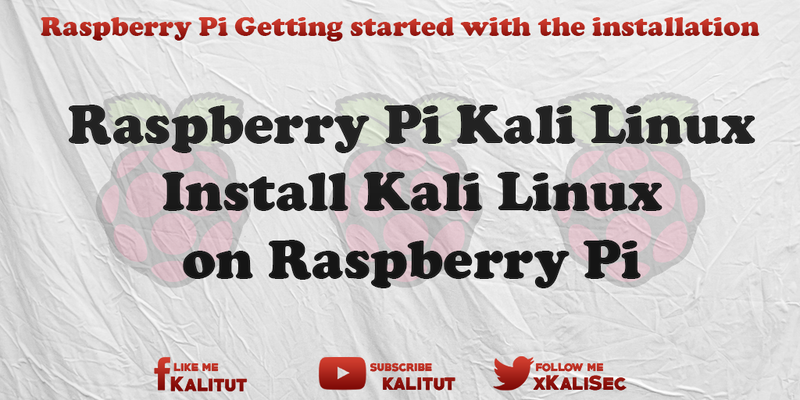 Kali Linux on Raspberry Pi typically starts on the console. First you have to log in and then start the graphical user interface "xfce".